Online catalogs provide fast access to product information and make a large number of products available to users. As a catalog manager, you can create your own internal catalogs and access external catalogs provided by suppliers using the open catalog interface (OCI) in the Catalogs view of the Product Portfolio work center. Catalogs can be used by employees for self-service shopping, for example, to buy a new laptop. The Catalogs view of the Product Portfolio work center enables you to import catalogs from your suppliers into your system. You can then publish the catalogs to make them available to employees to purchase items directly from the published catalog without needing to contact the purchasing department. Buyers can also access the catalogs directly from within purchase orders, requests for quotation (RFQs), and goods and services receipts. There are two types of catalogs in general. An internal catalog is a catalog created or stored in your system. You control how and when changes are implemented in each catalog. Each catalog contains materials or services that are structured in a hierarchy of categories, which makes searching for items more efficient. 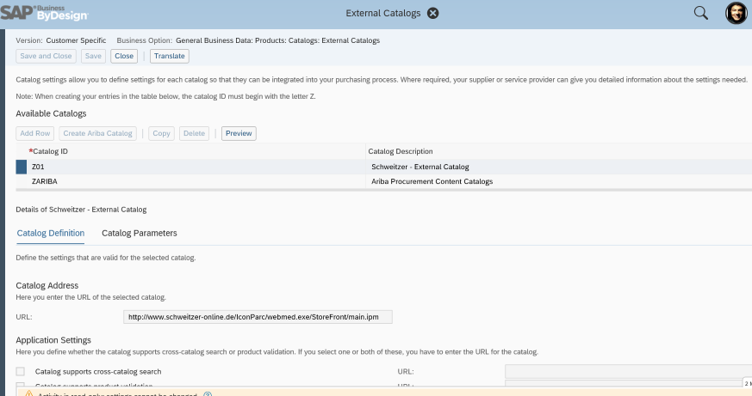 An external catalog is a catalog stored outside of SAP Business ByDesign, generally at a supplier site. The supplier is responsible for creating and updating the catalog, which means that you cannot make any changes to the content. If your company has its own catalog system that it wants to integrate into SAP Business ByDesign, you can set up an external catalog in your company’s intranet, which can then be accessed using the Open Catalog Interface (OCI). BMEcat is a widely-accepted format developed to standardize and simplify the exchange of product catalog data between buyers and suppliers. Most large suppliers can provide you a file in this format. This file type is mainly used for supplier catalogs. A comma separated values (CSV) file is a specially formatted text file that stores spreadsheet data in a very simple format. Each line contains one record, and each field within that record is separated by a character, such as a comma, semi-colon, or slash. Since the CSV-file format is not an industry standard and the creation of CSV file can be difficult, a template is provided in the Catalogs view of the Product Portfolio work center. You can easily create a file with catalog information in the template by entering mandatory and optional information. When you are done, you can generate the file, which is saved in a user-defined location. You can then create a new catalog into which you can import the CSV file that you just created. This file type is mainly used for custom catalogs. Go to the Business Configuration work center -> choose the Implementation Projects view -> Edit Project Scope -> Scoping step -> Ensure that Self-Service Procurement is selected within Purchasing. In the Questions step, expand the Purchasing scoping element and select Self-Service Procurement. Select Catalog Search and answer the questions related to supplier catalog use. The Catalog Search business topic allows you to use supplier catalogs in purchasing documents, such as shopping carts, purchase orders, goods and services receipts for limit items, and requests for quotation. When supplier catalogs are created in your solution, your employees can select items from predefined suppliers. This helps your buyers since they do not have to search for a supplier for every request. 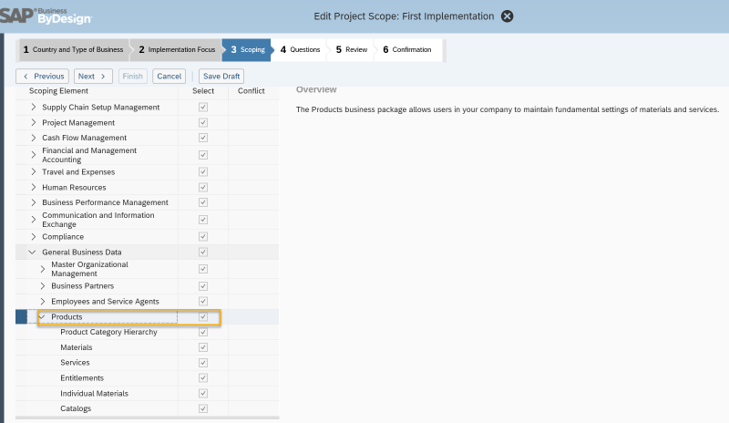 Go to the Business Configuration work center -> Implementation Projects view -> Edit Project Scope -> In the Scoping step of the project, ensure that Products is selected within General Business Data. 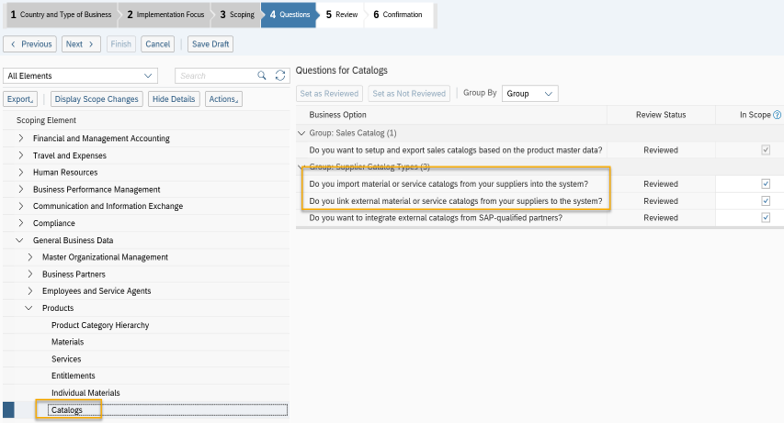 In the Questions step, expand the General Business Data scoping element and select Products. Select Catalogs and answer the questions related to catalogs. Go to the Business Configuration work center -> Implementation Projects view -> Edit Project Scope -> In the Scoping Questions step -> Ensure that Catalogs are allowed for usage in Shopping Carts and Purchase Orders. In the Product Portfolio work center, choose the Catalogs view. Click New and choose Supplier Catalog to open the New Supplier Catalog screen. Enter catalog ID and Supplier ID for the supplier catalog. Import the catalog file. Please be aware that each import overwrites the existing content. In the Catalogs list, select the supplier catalog that you have just created and click Import to start the Import Catalog activity. Once the import is complete, you can check the imported file in the supplier catalog screen. Make sure that Import status Successful and Publish the catalog there by making it available for all employees to use for their purchasing requirements. The value help for the fields in the CSV file template is only available in English. However, if you maintain a catalog in a different language, the field values will be displayed correctly. As creating a catalog based on a CSV file is intended for smaller catalogs, you may experience memory and performance issues in your spreadsheet application when generating large catalog files. You can create catalog files with up to 100000 catalog items. Depending on the security settings of your spreadsheet application, you may have to permit the running of macros. You can easily connect an external catalog to your system. Depending on the system settings, you can integrate external catalogs with shopping carts, purchase orders, requests for quotation, and goods and services receipts. You can transfer data from external catalogs to a purchase document using the OCI standard, which is the interface between external catalogs and your system. To use external catalogs in your system, you have to define the OCI parameters in the optional OCI Parameters for External Catalogs fine-tuning activity. This activity enables you to define attributes and parameters for external supplier catalogs so that they can be integrated in the purchasing process. Each defined supplier catalog is then visible in self-service shopping, purchase orders, request for quotations, and goods and services receipts. If the external catalog supports the cross-catalog search feature of the OCI, then this must be enabled when an external catalog is connected. The cross-catalog search allows you to search multiple catalogs at one time. The above blog gives the detailed overview of Supplier Catalogs and its usage in SAP Business ByDesign.